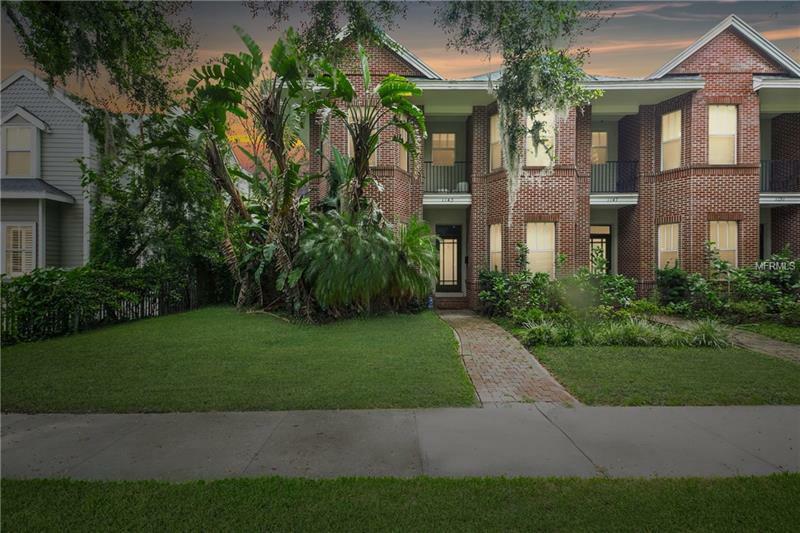 Come fall in love with this ultra rare tribute to the classic "Boston Brownstone" in heart of Orlando's coveted Delaney Park neighborhood. The burgundy brick facade and towering elevation reminiscent of Fenway and Brookline welcome you to a home like no other. This three bedroom, three and half bathroom, two story charmer is perfect for busy professionals or growing families. Interior features include vaulted ceilings, hardwood floors throughout, a beautiful gourmet eat-in kitchen with a gas cooking range, stainless steel appliances and sunken storage area that can be converted into a beautiful "mini" wine cellar. The second level features three large bedrooms each with their own private bathrooms and spacious closets. The "en suite" master features large walk in closet and an equally impressive master bathroom. Second and third bedrooms both have French doors/balcony access. You will fall in love with the incredible outdoor space! The large private deck is perfect for entertaining! The rear of the home features spacious separate outdoor lounge area perfect for "cabana" lovers. Home also features a private roof top deck which can be used for sun-bathing, reading/relaxing, or even a secluded hot tub oasis! Located near shopping, highways. In walking distance to public parks, lakes, and all that downtown Orlando has to offer. Zone for one of the best school districts in Orange County, Blanker Elementary, Blanker Middle and Boone High School!